I, Dedicate this website to Shri Kamal Narayan Seetha, who wrote the book"Power of Rudraksha"
Before you scroll down to view This website , it is best viewed in computer as it contains some heavy graphic/pictures and may not load well in mobiles. I get many mails how one can get fully ripen Rudraksha for germination purpose hence I have decided to add this message for readers.I can supply beads when I have a ready stock from rain forests,so first send me a mail to check if I have extra beads with me and then Plant beads in this monsoon(or in any season and in that case- plant seeds in shed) by the method given in this webpage and there is a big chance that they should germinate in the month of Aug-Sept. (or in 60 days if not planted during monsoon) itself. Any season is good but you have to observe heat factor,humidity and cold if you are in western India or hot countries like India. One more thing I would like to add, I get plenty of mails and I am sad to say that "many Indians" ask many things and then disappear after they come to know that this germination is a LONG PROCESS-their prime motto is perhaps that they have found a tree to easily get Eka Mukhi Rudraksha which infect is rarest of rare bead in this universe. So I request such people to stay away from mailing me, germination is a slow process and can take time. 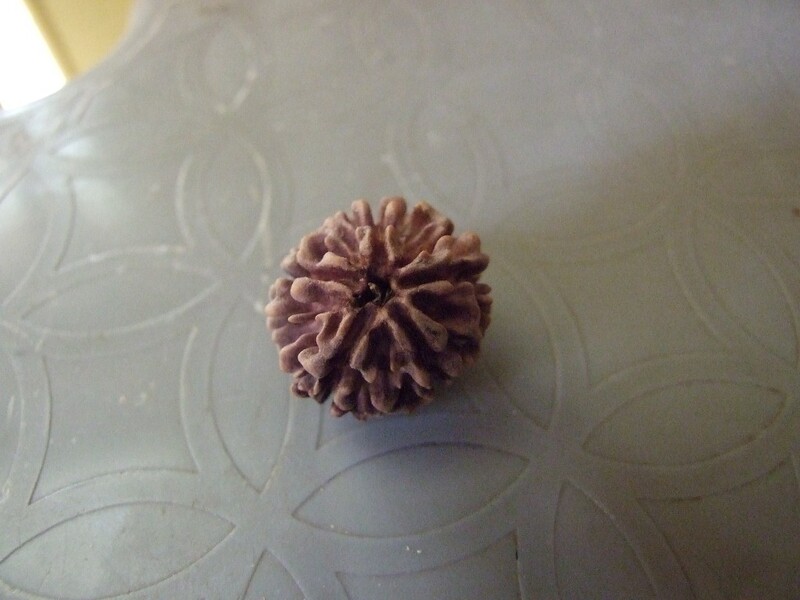 If you able to germinate a plant which one day hopefully turn in to a tree,same tree will bear 1 up to 29 mukhi Rudraksha. I provide beads in minimum quantity of 10(means roughly 30 to 40 seeds as each bead has min.3 to 4 seeds inside) is Rs.600-650 including shipping all over India, for out of India drop me a mail by typing your query using email,look for a paragraph in red fonts for my email address in the middle of this page(contact form I have removed due to spam mails problem).I do this to encourage Rudraksha germination at different places in world. Here please find a video link on how to crack and sow Rudraksha seeds with correct method.For this credit goes to my 13 years old friend from Canada- Navin.Keep it up Navin.One thing you all must note is he has NOT used seedball method so could not able to germinate seeds.Always USE SEEDBALL's METHOD.His video explains how to crack bead and extract seeds out of it,then go as per blog writings else germination may never occur from seeds. Youtube video on planting Rudraksha seeds in a pot. Each one have their own goal in their life,the moment it clicks this material world seems to be useless one. I don't know how to begin my writeup for this subject as I am neither botanist nor farmer.It was somewhere in 2005 If I recall correctly that I started to take interest in Rudraksha.Slowly I bought several Rudraksha beads and some malas due to my love towards Shri Shiv and Shri Shakti.This blog is not to speak about my spirituality at all as I am too small/tiny in this area but here I shall tell you about my personal experiences in propagating Rudraksha at my own place from seeds.This I decided to share because it is damn difficult to grow Rudraksha from seeds due to hard outer body shell.In Botany it is a quite difficult job and it takes roughly around a year and a half to germinate Rudraksha from seeds.Here let me say that the Rudraksha which you know till now is a Fruit and inside this fruit there are several seeds from which germination takes place in suitable conditions which we shall discuss after sometime. So one day there was a burning desire started to irrupt from my heart to plant divine Rudraksha in my garden.I have quite a lot of spare space where I live so planting this holy tree was not an issue.Remember once Rudraksha tree reaches to a height of 20 feet,roots come out of soil and burst all over(Check google images)and in such case it is difficult to use lawn machine around that tree.In spring season old green leaves turn dark Red and makes a very scenic view for eyes.Sometimes dark Violet fruits and Red leaves combo look very attractive in garden or at public gardens like in Australia. Now big question came-from where I can buy this plant?One day when I was in one local nursery on Sunday and found that there was one plant known as "Real Eka Mukhi Rudraksha"for sale and without any second thought I bought it and planted on a spot which was having some sunlight in noon and shadow in afternoon.Mercury touches to 42+*C in summer here so I decided to plant it on such a place which has less harsh sunlight on this plant in noon.This setting worked perfectly fine and I could see nice growth in plant for few months but in the month of April 2008 this plant started to dry out for no reasons.I was taking lot of care since I planted it in my garden but it could not survive and one day it died and that was a big shock to me. Next day I again inquire about the availability of this plant and found that there were 4 plants available at local nursery and all of them I bought and planted in my garden.In next couple of years I was having total 12 Rudraksha Plants growing well at my place and I was waiting for a day when they will grow mature and bear Rudraksha fruits on them but something else was written on the wall for me by God. One day my supplier of Rudraksha tree Mr.Vikram called me on my cell and said get ready in 5 minutes as he is coming to pick me up a big surprise.I was wondering and thinking what was hidden in this surprise and in few minutes he came to pick me up and said we are going to one farm house and there is one surprise for me.I kept quite and we drove to approx. 30 K.Ms far in one remote farm house,went inside and he told me "see this"by showing me one Tree just in a corner planted very close to Bilwa tree.My mouth remained open!There was one mature Rudraksha tree with Fruits hanging all over!He plucked 3-4 fruits and gave them to me.I cleaned fruits,remove shell cover and taken out Rudraksha but the shape of these Rudraksha was not like what I and You are familiar with.Those were 3 and 4 mukhi Rudraksha with little oblong shape which is known as Haridwar variety in common terms.I asked Vikram, is this same plant which I am growing at my garden?Yes was the answer from him!My heart broke again and in return journey from farm house to my home I could not speak much.My mind was full of thoughts,from where I can get genuine Rudraksha plant and I started to search Internet. Shaivism and Iskcon,both go together-some past life connection called Rina! In 2005 or around I was(and I am)member of various Yahoo groups among few of them don't exist now-owner of those group deleted them for various reasons and one of the group was known as Sacred-Objects run by Shri Richard Shaw Brown from Thailand.He himself from Iskcon and was very close to Swami Prabhupada.From this group I learned a lot about Rudraksha and few other members used to discuss lot of informative topics on Rudraksha Propagation.One member Shri Chandrashekhar Phadke from Poona shared lot of information with me on this subject and many times he warned me that local nurseries in India sell Elaeocarpus Sarratus instead of Elaeocarpus Ganitrus(Rudraksha Tree's Botanical Name) and in such cases buyer only know this fact after 7 years once this tree start giving fruits.So for 7 years he keeps thinking that he has planted a real Rudraksha tree.I was not that unlucky because I could know this fact during my visit to farm house which I have mentioned above.I asked him from where I can buy Elaeocarpus Ganitrus(Let us call this a Nepal Rudraksha tree) OR Elaeocarpus Angustifolius(Rain forest Rudraksha Tree)and each time he said find a good and reliable source for this. 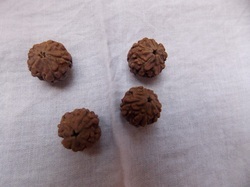 I had limited options so I decided to order some Rudraksha Fruits from Nepal in 2009.Please check picture which I have uploaded earlier on top of this page.I received around 200 Fresh Rudraksha fruits from Nepal and I again started to dream again about growing Rudraksha in my garden.But this project failed and no seed germinated out of soil though I waited for 2 full years!Now I was almost going to give up this holy mission of growing Rudraksha in my garden.Each one of us have our own limits and from 2005 to 2012 I was feeling exhausted and was very sad that I am not able to do this job.Many people said to me this tree only grows in Nepal but the fact is Besides Nepal, rudraksha trees (commonly Elaeocarpus ganitrus/Elaeocarpus Angustifolius) grow in India, Indonesia, China, Hawaii Islands,the Solomon Islands,the Mariana Islands,Guam and Papua New Guinea. One day I found few pictures of Rudraksha posted by one member in Sacred-Objects group in Yahoo.While browsing I found that these pictures of Rudraksha have origin in Hawaii Island and again my old habit of Rudraksha Germination started to ride on my head.Now came a million Dollar question will this member help me?Forget helping will he even take a care to reply my mails?He is attached with Iskcon and will he help me to grow Rudraksha which has association with Shaivism? Dear Readers here comes the main hero of this mission,please hold your breath.But before that I would like to say something.Road to Shiva goes via Krishna and Road to Krishna goes via Shiva.Below is a tweet of my friend which explains this in a better way-If Your worship of Shiva succeeds, you will learn about Krishna and if your worship of Krishna succeeds, you will learn of Shiva for sure. Devotee of Shri Krishna from Hawaii,let us call him Shri Krsnadasa. I have decided to hide his real name due to his privacy issue because I have not taken his permission yet.So one day I sent him an offline message in Yahoo Messenger that I need his help and want to know more about Rudraksha growing in Hawaii. (You may also use Google and search Rudraksha forest in Hawaii).Next day I got a reply of my message in Yahoo Messenger and he advised me to send him a mail.Shri Krsnadasa was kind inuf and shared his email address with me and advised me to write a mail to him.Our conversation started and he also told me that to grow Rudraksha from seeds is Himalayan task and will take 1 to 2 years.Then he told me that he can arrange some Rudraksha beads for me from Hawaii forest which he finally managed in late 2011.The first pack which he sent never arrived and lost in transit.Then one day a packet arrived with beads and in next few months he again send me Rudraksha beads which he collected from forest. Now just note one thing,I am in India and he is in Hawaii.We both never met ever in this life still he goes in deep rain forest filled with poisonous insects and collect Rudraksha for me,this he does by going barefoot without any protection,an example of true devotee and genuine Vaishnava! !This must be our past life connection known as Rina. Stage was set,I took 2 big clay pots and filled them with loam type soil.Biggest problem here in India that when I used to put seeds in soil insects like ants used to eat them almost every time so this time I used seed balls and put seed inside the seed balls.This method of seed ball is of Fukuoka a great Japanese scientist.Use Google to find more info on seed balls. 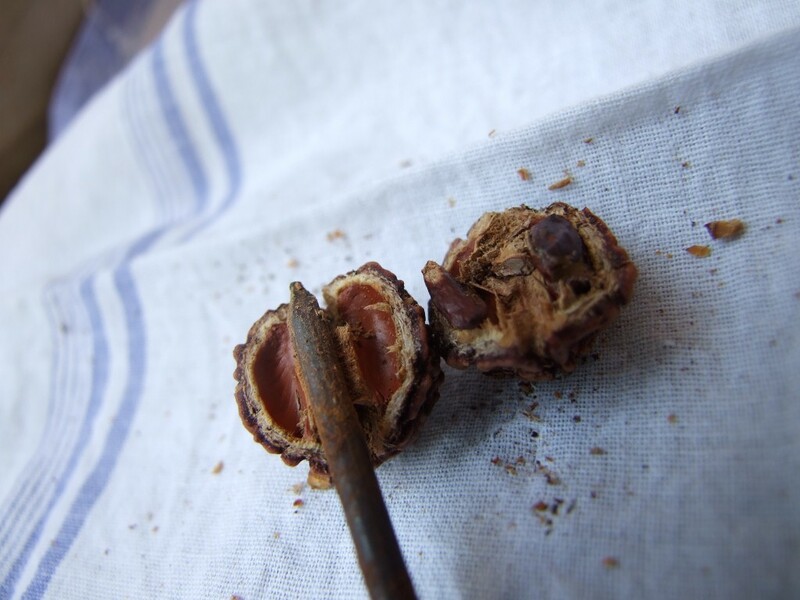 You must have observed that sometime I say bead and sometime I say seed when I talk of germination.To clear this confusion again let me say that Rudraksha is a fruit and inside this fruit you can find seeds,hope its clear now. On ShriKrishna Janmashtami around 3 P.M I decided to sow these seeds from Hawaii finally.Some how some unknown force was pushing me like a mother taking her child to K.G school.I never made seed balls in my life-made lot of errors but finally I managed to make them round and insert a small seed of Rudraksha inside them and then sealed them with wet clay over the hole.The job of my was over now it is up to the nature to give some final touches to this mission. 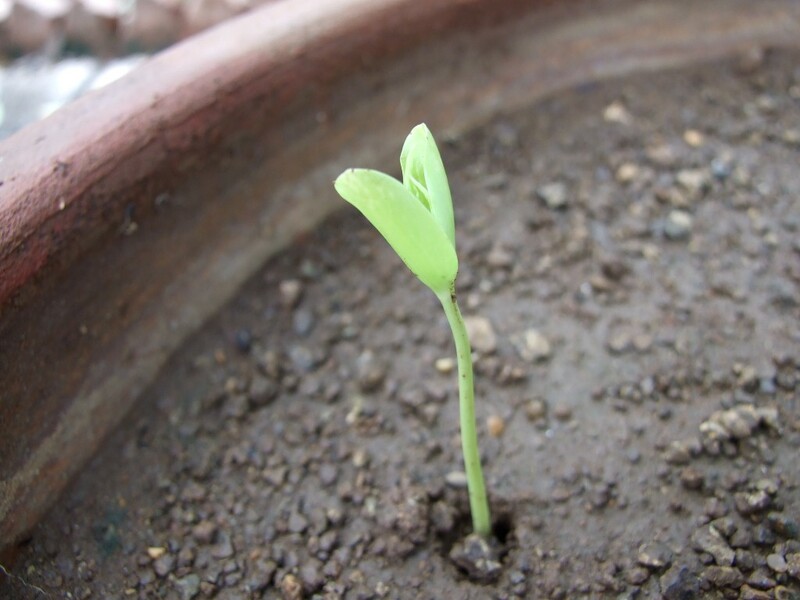 On September 6th 2012 it rained like cats and dogs.I was worrying whole night as I sowed seeds not too deep in a pot and it was almost 20 days since I planted those seeds in a big clay pot in my garden.This night was too long for me and I said to God please stop testing me now as I am too tired and totally exhausted. 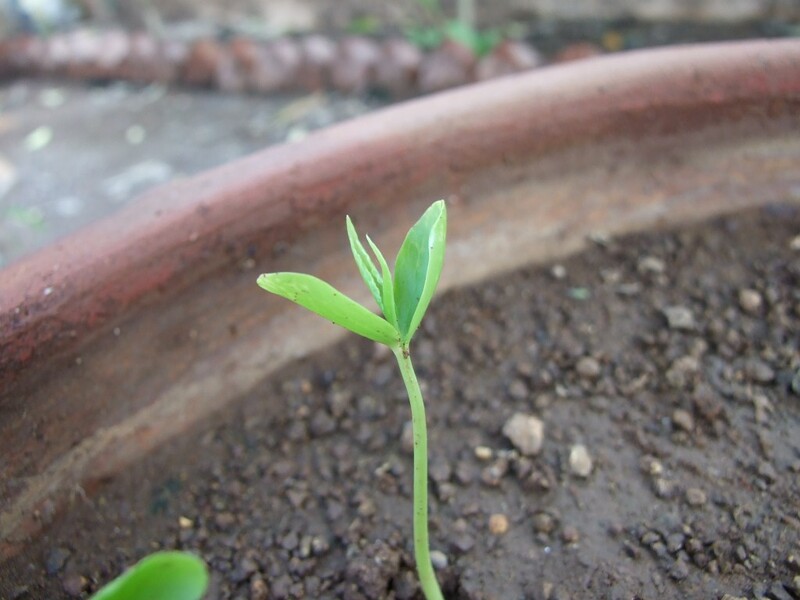 In one corner of a pot I found one seed which was thicker and some whitish part like very small tail came out of it.This moment I shall never forget in my entire life.Finally the first germination happened after 7 years of my efforts.I sent a mail to Shri Krsnadasa and said one seed is about to germinate.He was surprised that in so much short time of 5 weeks it happened.I promised him that when stem comes out I shall send him pictures. 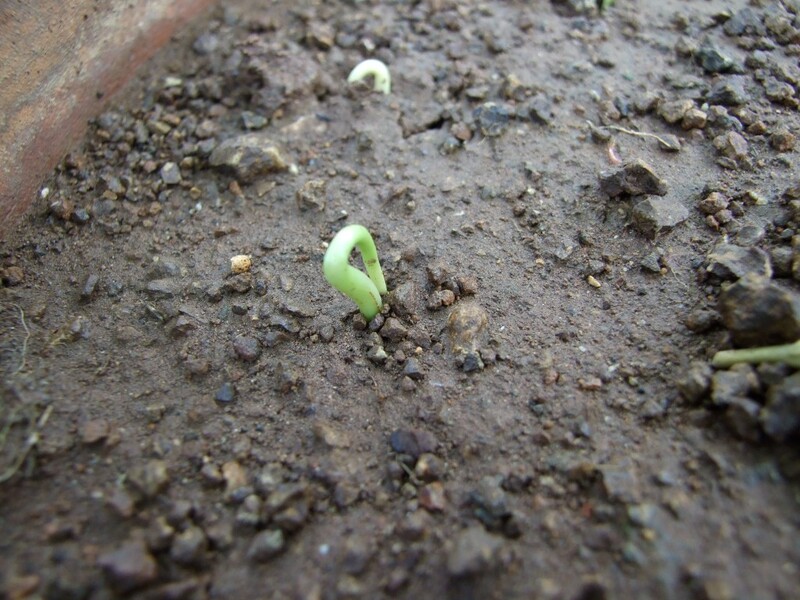 Now let's make this story short.Seedlings came out and I sent pictures to Shri Krsnadasa in Hawaii.He finally said yes they have germinated! 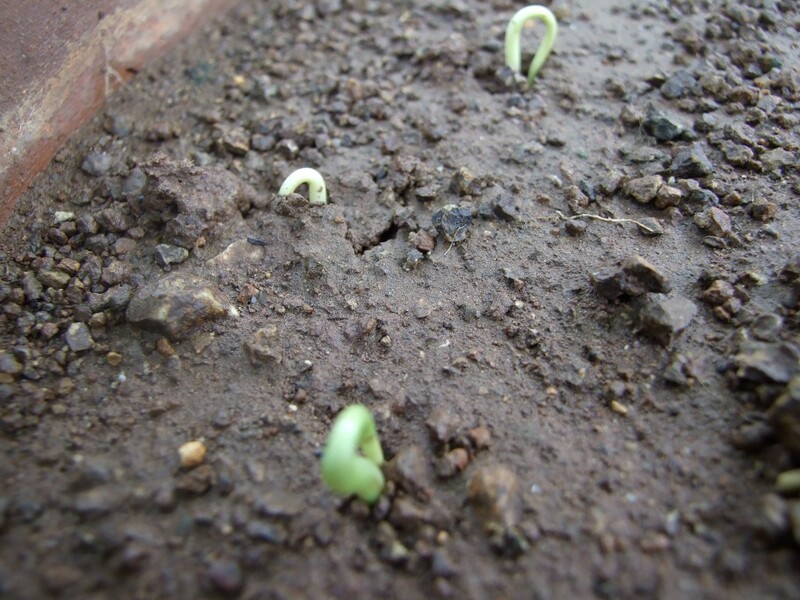 In the end I shall show you how they germinated finally.This journey took almost 7 years which was started in 2005. Few other points I also would like to mention here.Supplier-Farmers of Nepal and Indonesia are very greedy and they pluck immature beads from tree so that was the reason why I could not grow those beads.Another reason is very cruel,they use such a cruel process in which all fruits of Rudraksha put in a barrel filled with water and they start boiling it,temperature of water go up and water starts to boil which softens the outer cover of Rudraksha fruits for cleaning process and help beads to appear clean and shiny.Thus if possible always use a FALLEN MATURE FRUITS FOR GERMINATION PURPOSE else germination will not take place.For this purpose you may have to collect fallen fruits from ground or find a devotee like ShriKrsnadasa who can help you in providing these fully ripen Rudraksha fruits for propagation purpose. 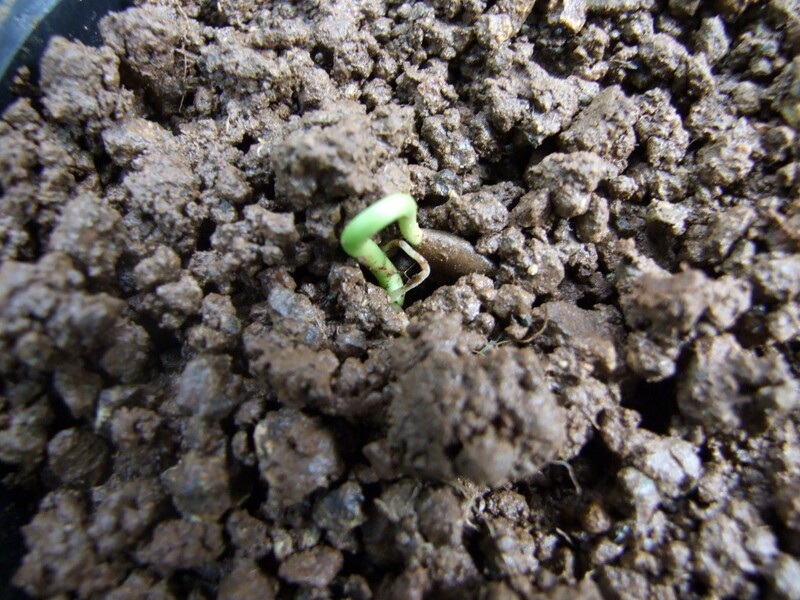 In this picture you can see a small stem came out of soil,this happened approximately after 5 weeks after I put seed balls into this small pot. Here now I go step by step and describe the process. 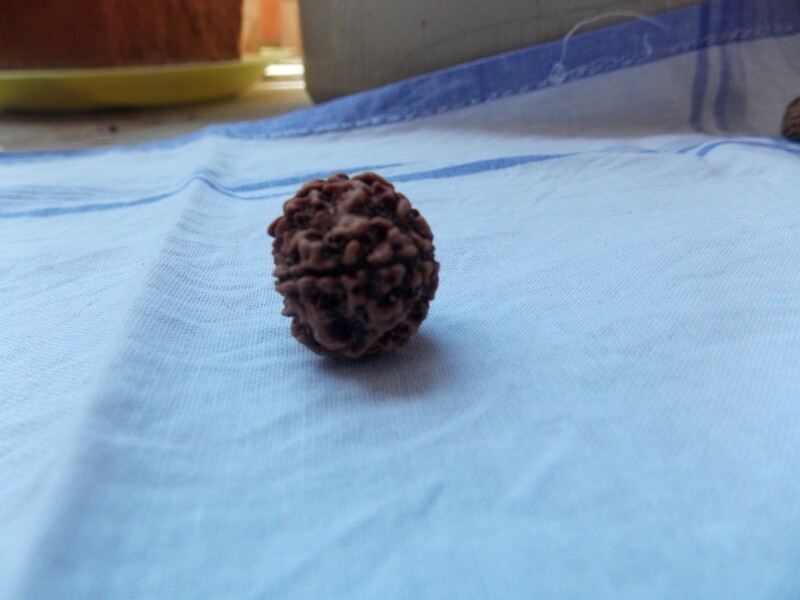 *Select only fully mature Rudraksha for this purpose. 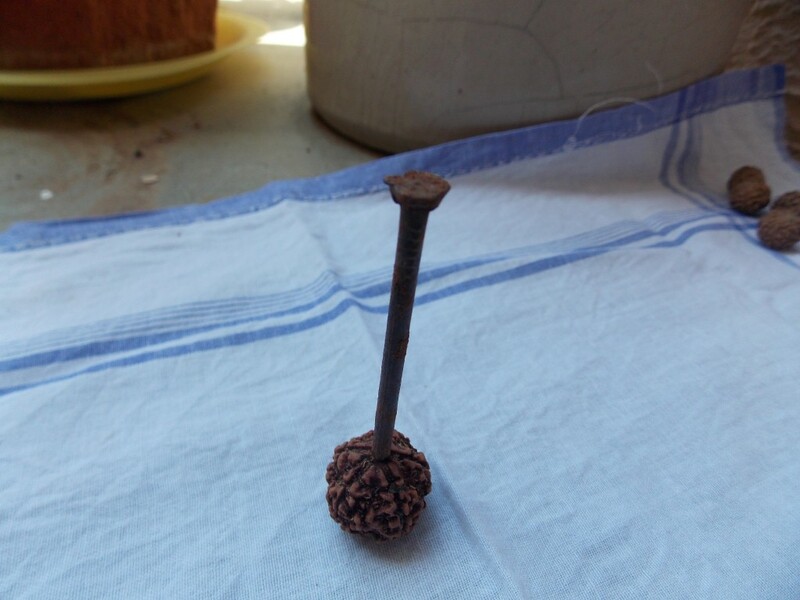 *Sit on a firm place,take Rudraksha bead in your hand and use a mid size nail and hammer. 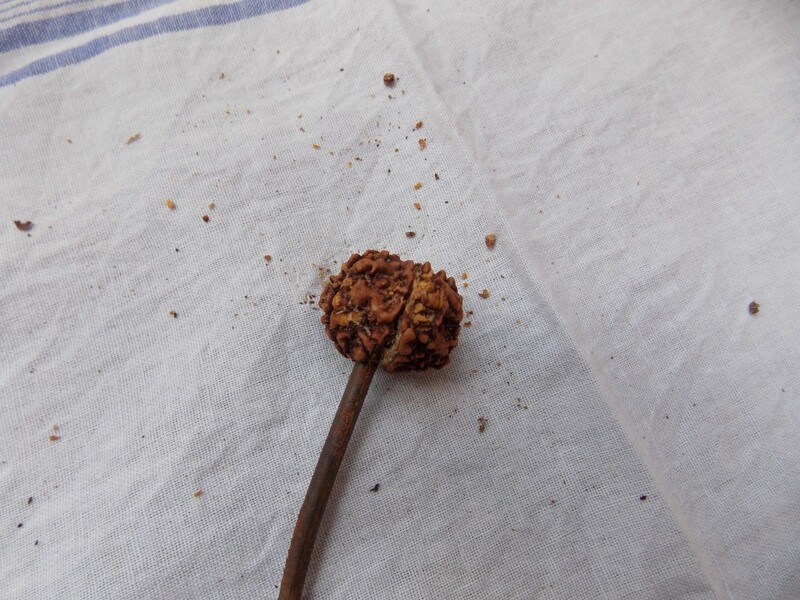 Insert nail into the natural hole on Rudraksha and hit the nail with a hammer.Slowly bead will start cracking up and couple of seeds will come out once you fully break this bead.Take these seeds with broken parts of bead(you also need to sow these parts of broken beads known as Kernel in a clay pot for germination though it will take 6 months to 1 and half year depending the hardness of Kernel). *Take some clay,add water in it and start making seed balls.To master this process one may do some lesson in your kitchen during your Mother or Wife preparing Roti for family.Just observe how she prepares balls out of Atta means whole wheat flour.Prepare few seed balls and then you are ready to insert seeds into these seed balls.Use nail and make a hall in seed balls and then insert seed inside it and then seal the hole with wet clay.You are done. 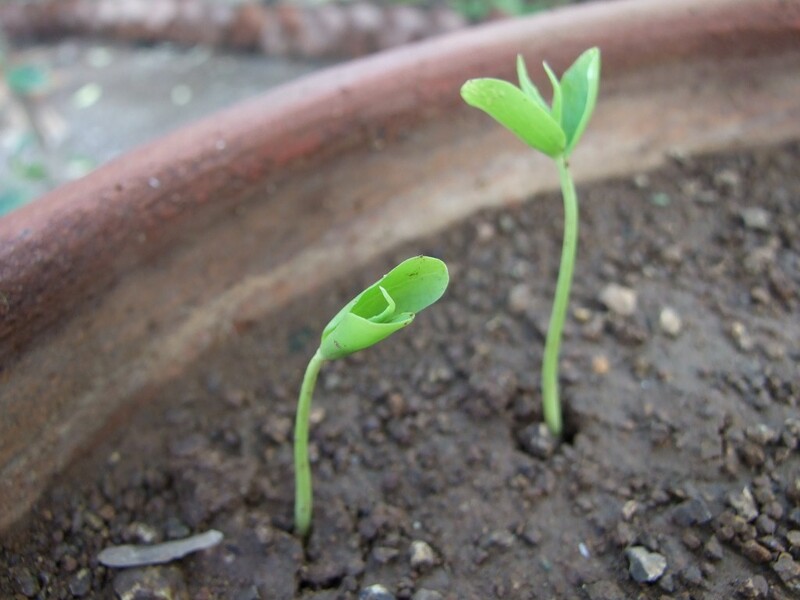 *Put these seed balls just 2-3 inches deep and cover the pot with loam type soil,I have used loam soil at my place in a clay pot. 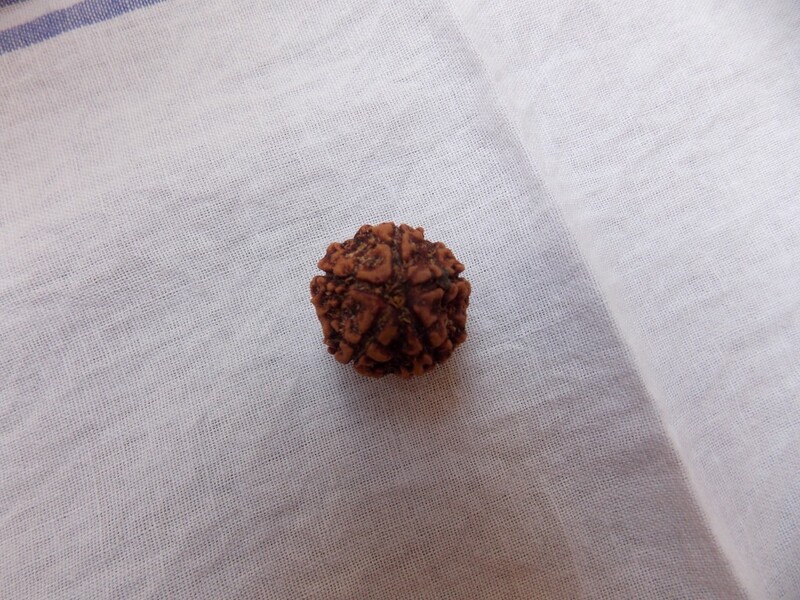 *Sadly one cannot find full proof process to germinate Rudraksha in any book or in any website and this is the reason why I want to show how one can grow Rudraksha from seeds,such information must be shared for future generations in my humble opinion. 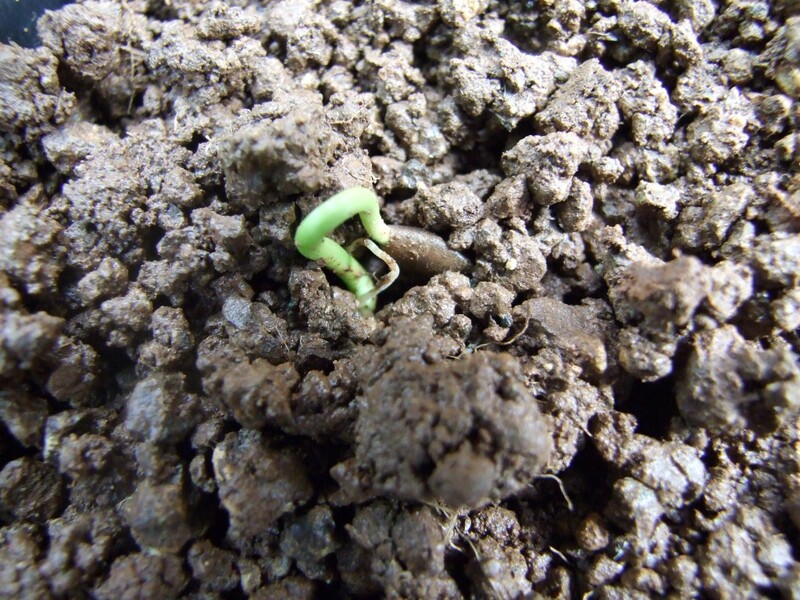 See how root comes out like a tail from small seed of Rudraksha.To take this picture I took out the seed from seed ball and this is the first picture ever of Rudraksha germination on internet. Mr.Narinder Rana a good friend of mine and a true Shivji Devotee.Without him my journey and love towards Shivji was not possible.Shri M.Jani a friend of my papa who taught me many things about many wild species in forest and Rudraksha,he is the man who first introduced me to Rudraksha.Next comes is Shri Richard Shaw Brown a leading gemologist from Thailand,I learned a lot from his Yahoo Group which is now deleted,I found Shri Krsnadasa of Hawaii threw his group so my special thanks to him as well.Shri Chandrashekhar Phadke gave me some good tips and this person who himself related to botany is a treasure of knowledge.Dr.Shri Manish Pandit and Shri P.V.R Narasimha Rao my special thanks to you two because without Mahaganapati Homam perhaps the obstacle of Growing Rudraksha was not possible. Finally my botany professor Shri Joshi who was a silent supporter for me for this project. 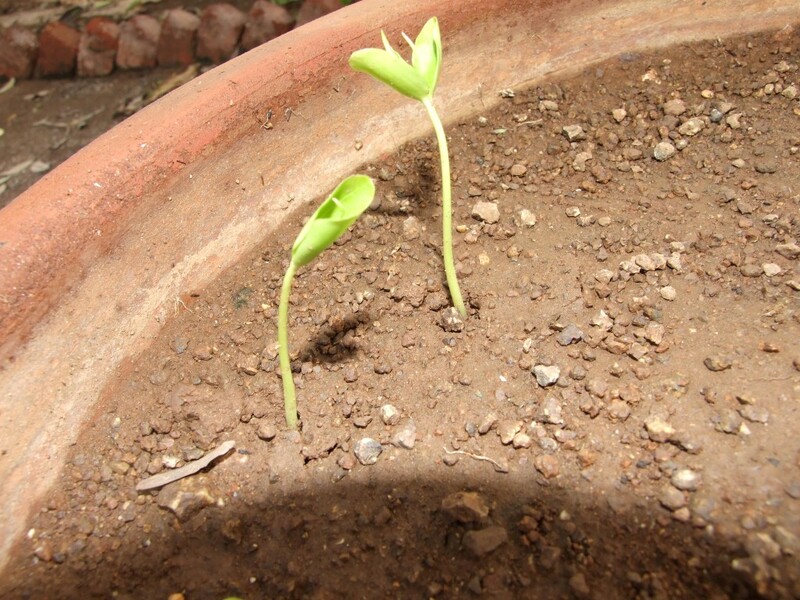 I am also very much thankful to my dear friends Manish Chauhan and Niraj Thakker who both are now growing divine Rudraksha plants at their places,they also gave me moral support in my life many times as well,thank you very much Niraj and Manish. Finally my salutes and pranams to Shriman Krsnadasa of Hawaii,this project was not possible without his divine help. Jay Shri Krishna Har Har Mahadev Har.Om Shri Matre Namah Om. Or use below form to reach to me. Blog created on September 22nd,2012. Update no.1-Date 30th September,2012,I have added below a tutorials with pictures as per requests received from members. 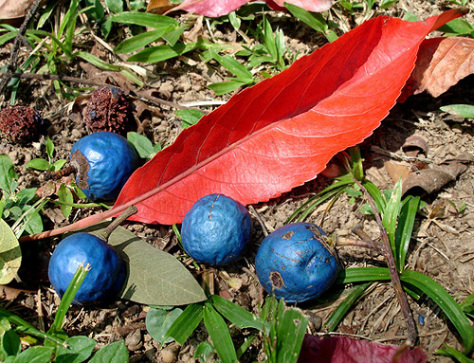 Fully matured Rudraksha fruit fallen from a parent tree. Hawaiian Rain Forest Elaeocarpus Angustifolius Rudraksha,here you can see tail part where it is difficult to count facets(mukhs)of Rudraksha. See here,left part is called Tail which is Flat and right part is called Mouth which is pointed part of the bead. 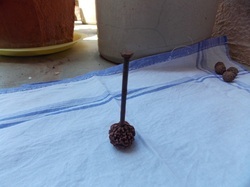 Insert the nail into Mouth part of the Rudraksha and press it little so it goes in firm and stay upright.In this demo I have used Nepal's Rudraksha. 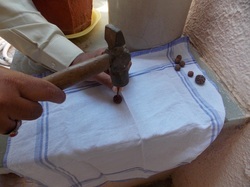 Start hitting the hammer slowly,bead will start cracking up and you can later able to crack the bead into two parts. Finally when bead breaks up into two parts,you will able to see seeds.Take these seeds out and wrap them in seed balls and plant them in pot. 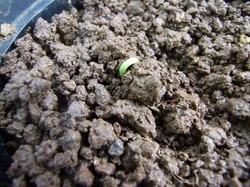 Two seeds visible in this picture. 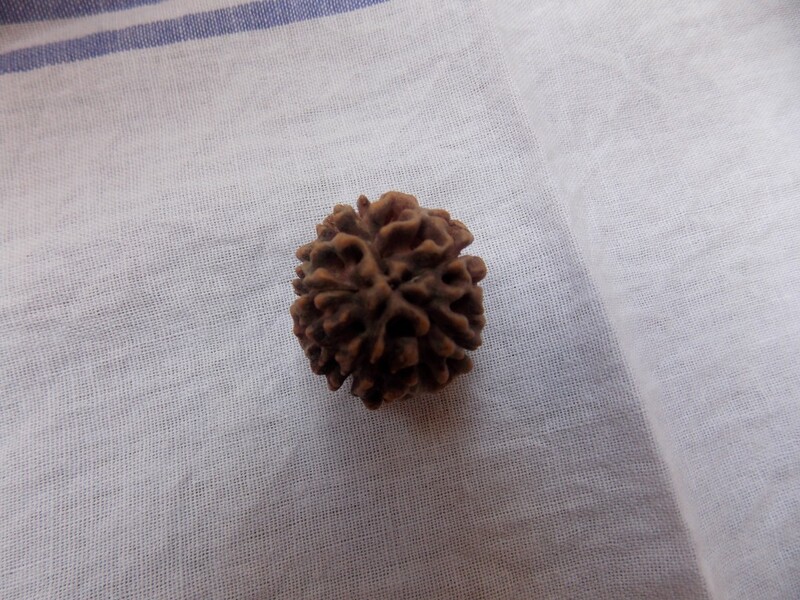 Here have a look on various types of Rudraksha available in the world.I have already posted pictures of Nepal beads above,here find Hawaiian Elaeocarpus Ganitrus bead of Rudraksha. 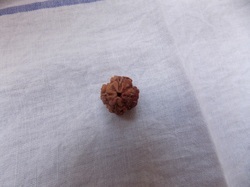 This picture is of ShriKrsnadasa's backyard tree's Rudraksha.Elaeocarpus Ganitrus. Here are Hawaiian rain forest Elaeocarpus Ganitrus Rudrakshas. Thanks for watching this update no.1,if any queries kindly use Feedback form given above,I promise a reply but do not repeat same queries which have been already discussed here in this website,a request.